A look at the statements of the last Autumn Council. Making a distinction between clean and unclean animals, insofar as using their flesh for food is concerned, has long been a well-known practice among Jews. It has a place, too, among the beliefs of Seventh-day Adventists. A reader asks: "Is it disrespectful to use You instead of Thee and Thou when addressing the Lord in prayer?" If there were no pastor, if the sheep were left without shepherds as they were in Jesus' time, the helpless people would be harassed and ultimately destroyed. Our people need to be visited, but every visit should have a purpose. 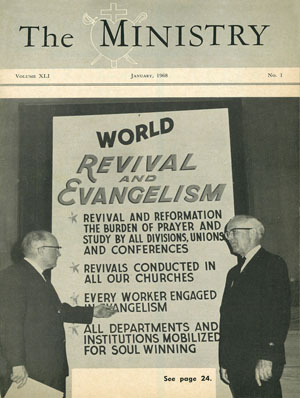 From August 5 to September 2, 1967, seventy workers and students participated in the first field school of public evangelism to be held in the Korean Union. "The one great cure for any ills in a church is evangelism." More than perhaps any other group of workers, church pastors or district ministers are on their own when it comes to the administering of their days. . .